Speculative on the 052E. These YouTube videos probably got the text somewhere but I don't know where. Speculative art on how the 052E might look like, the illustrations look like a kitbash of a 052D and a 055 using the 055's integrated mast, SSR ring, and funnel design on the 052D type hull. The video has a few art designs. I don't think the design with a SMART-L type array in the aft is the way forward, I suspect that although such a radar project may have been worked on (based on an official model of an export 052D proposal), it may have been canceled and not accepted by the PLAN, hence its absence on the 055. Technically the video is awful, uses a robot voice typical of many military news YT videos, reciting text that was copied off from somewhere not attributed. But I do like to present the illustrations of how an 052X hull with the 055 integrated mast looks like, and I think the 052X with an integrated mast is the future direction of the line, though the real design of the mast may still differ. At present, among the Chinese navy surface ships, the 052D destroyer is the most equipped and continues to produce. Although the Chinese Navy has begun to build the 055-type destroyer with more tonnage and more advanced performance, the 052D will continue to be built because of its excellent cost performance, especially the current positioning of the Chinese Navy. However, in the face of rapid development of technology, some technologies of 052D are inevitably backward. With some of the advanced technologies on the Type 055 destroyer, the 052D is selectively improved, so the price/performance ratio of the 052D will be better. The West said that China has begun to build a modified version of the 052D, called the 052E. According to Western media, the shape of the 052E and 052D is not much different, mainly because the 052E is suitable for the needs of the straight 20-ship helicopter. The helicopter landing platform of the stern has been extended, about 5 meters, and the machine has been lowered. Library height. After having a straight 20 general-purpose carrier helicopter, the anti-submarine capability of the 052E will be greatly improved. Because the Straight 20 is a 10-ton medium-sized carrier helicopter similar to the US MH-60R, the airborne equipment is much more advanced than the current German-developed Ka-28. The combat radius can be extrapolated to 150-200 km and can be executed for about 4 hours. Anti-submarine mission. In terms of weapon mounting, Straight 20 can easily mount two anti-submarine torpedoes. At the same time, in addition to airborne radar, it can also carry a full set of anti-submarine search equipment, such as hanging sonar, sonar buoy, magnetic detector, etc. . In contrast, the original widely-equipped 9-ship light-duty helicopters can only mount one light anti-submarine missile in the standard anti-submarine warfare, and cannot carry multiple search equipment at the same time. The anti-submarine warfare radius is only 50-100. Kilometers, and the short time is short. Although the maximum take-off weight of the Ka-28 reached 12.6 tons, the airborne equipment and anti-submarine weapons are obviously backward. It is becoming more and more difficult to deal with modern low-noise submarines. Moreover, the Ka-28 is an imported model, and we cannot improve it ourselves, and its future development potential is also lost. In addition to its excellent performance, Straight 20 also uses a low tail beam structure like the American Seahawks. The height of the tailstock beam is only 4.04 meters after folding, which is 1.1 lower than the coaxial hub of the Ka-28. 4 meters, so the hangar height can be significantly reduced, and the reduction of the hangar height is very beneficial to improve the stability and airworthiness of the 052E. In addition to the anti-submarine capability, because of the addition of the Straight 20 helicopter, the 052E's new generation of universal vertical launch system is more abundant in loading missiles and can be loaded with domestically produced domestically produced missiles. In addition, when the original 052D was designed, the design of the 052C was basically followed, and the stealth details were not greatly improved. The main purpose was to replace the new active phased array system and the first generation of the universal vertical launch system. Improve overall operational capabilities and achieve generalization goals. From the current results, this improved model is quite successful, and the price/performance ratio is very prominent. However, because of the design positioning at that time, the stealth ability of the 052D was still at the level of the early 21st century. In addition to continuing to improve its comprehensive combat capability, the 052E has also achieved a stealth capability because of the successful construction of the Model 055, which has enabled the Chinese Navy to reach a new height in the stealth of surface ships. The 052E will have stealth results on some of the Type 055 destroyers, such as the advanced stealth integrated mast, which integrates most of the electronic equipment on the 052E, making the ship's stealth effect significantly enhanced. However, due to cost considerations and operational positioning needs, there is no X-band radar like the 055. Last sentence makes no sense since you would still need some kind of C or X band radar for surface scanning and for navigation, in order to resolve small ships and objects on or flying low near the water surface. It would also be contrary to a design if you have the 055's integrated mast. Speaking of the integrated mast, in my opinion, I would have rotated the mast so that instead of being square with the axis of the ship, it would be diagonal or diamond to the axis, turning the faces into diagonal positions and with the same angle as the main Type 346 panels. That may also reduce the mast's RCS to the front and sides. It's from Sina Military, not the best source either. The last bit about the integrated mast is that 052E's mast would be designed based on the 055 mast but will not equip X band radar to reduce cost. The last part doesn't sound right since you would need an X-band radar for your gunnery and antiship missile fire control, as well as surface scanning. Unless they mean they won't put an X-band AESA radar there and go back ---- more like retaining ---- the mechanical fire control radars used on the 052C/D, the Type 344 and 366, which are both on X-band. Respectively they are used for gunnery and antiship missiles. That's not much of an improvement over the 052C/D. I would think they would cancel the Type 364 radar that sits on the top of the 052C/D mast, since this means the Type 055 type mast won't be having any radar at all without the X-band, the only sensors being the ESM stalks it has on top. To replace the Type 364 which acts as a surface search radar (SSR) it would have to have that ring of arrays on top the bridge, like you see on the 055. The 052C/D carries its jammers on the mast too, but the 055 type mast doesn't. This means the ECM array would now be set on the side of the superstructure, much like we think the 055 does. This is similar to the fan CGIs in the video or Sina article but you have to erase the X-band array from the top mast and put back the Type 366 dome and the Type 344 radars from the 052C/D. This tweet is from @dafengcao. 119 Guiyang from Dalian is getting her number painted. AF-1, mr.bean, Equation and 4 others like this. A 052D under construction at Dalian. Judging from previous photos, this should be 119.
newbird, AF-1, AeroEngineer and 9 others like this. Type 052D et Type 052C, côte à côte. 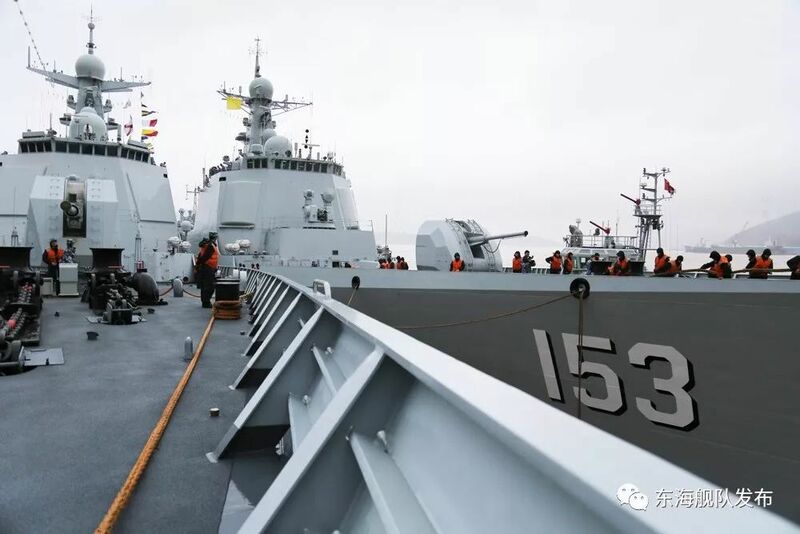 Type 052D and type 052C, side by side. Yodello, jobjed, Equation and 8 others like this. The 052D on the left must be one of the recently commissioned ones, without the calibration booms on the main arrays. I suspect ship no. 161. 052D (DDG 174) firing its forward CIWS... Click here for the original resolution (4504 x 2721). newbird, Yodello, Neutral Zone and 7 others like this. Posted by LKJ86 from the PDF. Shipbucket style art for the 052B to D series. J16B MRF, mr.bean, mys_721tx and 1 other person like this.